Tyre balancing at Robbo's Automotive & Tyrepower Morisset is performed using the finger plate technique this is standard at Morisset Tyrepower and is often an "upsell' by our competitors. Contact us today at (02) 4973 6632 or visit us at 3/5 Gateway Blvd, Morisset to get your vehicles tyres balanced. Let? take an example: You have driven your tyres 5,000 Kilometres since their purchase and it's time to rotate. 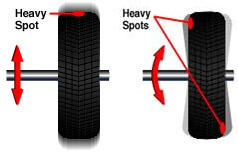 Over the miles, turning left and right, hitting bumps and holes you could not see or avoid, and driving down uneven road surfaces have led to uneven tread wear on your tyres. Perhaps a pothole has knocked-out your vehicle's alignment (this creates uneven tyre wear).